Author: Christfried Naumann. Series edited by: Harry Stroomer. 22 pp. Roman, 436 pp. 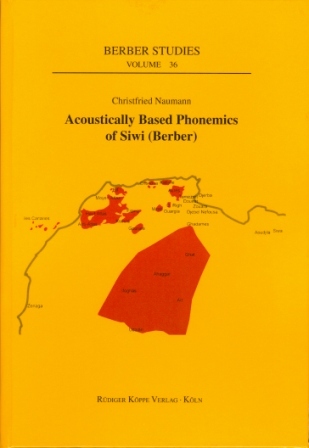 This dissertation investigates the inventory of segmental speech sounds and their acoustic characteristics for the Siwi language, which is the most easterly variety of Berber spoken by approximately 15,000 people in the oases of Siwa and Qara in the northwestern part of Egypt. The status of Siwi as a spoken language is rather strong in Siwa and Qara as compared to the situation of some other Berber varieties. Siwi is not an undescribed language, but most of the relevant existing literature can be subsumed as word lists, grammar sketches, or articles dedicated to specific topics. The purpose of this dissertation is to investigate the inventory of segmental speech sounds (phonemes) of Siwi by characterising their distinct acoustic properties. This approach is assumed to improve the validity of phonemics within descriptive linguistics (‘basic linguistic theory’), which conventionally relies on impressionistic, non-falsifiable phonetic transcriptions. The conclusions of this study are drawn from the acoustic investigation of elicited words and phrases recorded with five speakers, based on preceding lin­guistic fieldwork and the manuscript of the sketch grammar by Vycichl 2005 (see link at the bottom). The structure of this thesis is as follows: chapter 2 gives an outline of the basic theoretical assumptions, concepts and premises. Chapter 3 provides a brief introduction to acoustic techniques in order to facilitate the access to the evidence and illustrations of the later chapters for readers less familiar with phonet­ic data. Chapter 4 describes gross acoustic features by which the major sound classes, such as vowels, stops and fricatives, can be distinguished independent from context. Chapters 5 through 7, in turn, inves­tigate more fine-grained and context-sensitive distinctions (related to place of articulation) and the result­ing sound categories within the major sound classes. The feature system is continued, with slight modifi­cations, for the examination of the remaining classes of consonants in chapter 6, while chapter 7 discus­ses vowels. Chapter 8 summarises the inventory of distinctive (segmental) speech sounds of Siwi, pro­poses an orthographic representation, and briefly addresses phonological topics not covered by the main chapters or requiring further research. This book is the fully revised version of the author’s PhD dissertation that was accepted under the same title the Faculty of History, Arts and Oriental Studies at the Universität Leipzig/Germany, following the defense on June 24th, 2011.